Over the last century effectively treating a decayed tooth has often required removing any decayed structure with drilling and then filling the remaining cavity. While this approach does save teeth that might otherwise be lost, it can also result in a fair amount of healthy structure removed in the process. But continuing advances in dentistry are now making possible a new approach to tooth decay treatment that preserves as much of the healthy portions of tooth as possible. This new way is often referred to as minimally invasive dentistry (MID). The primary goal of MID treatment is to intercept and treat decay as early as possible to minimize tooth damage. It begins with helping patients identify their own individual risk factors for decay such as the presence of disease-causing bacteria, the adequacy of their saliva flow, or their lifestyle and dietary habits. We then recommend changes or preventive measures to reduce those risks. The next step in MID is using various diagnostic technologies to find decay as early as possible. X-rays continue to play a major role, but dentists are also using dental microscopy to magnify the earliest forms of decay. Many also utilize laser fluorescence, infrared photography and optical scanning to further “see” decay difficult to detect with the naked eye. In regard to treatments, MID adopts the adage “less is more.” If caught early enough, we can encourage the re-mineralization of enamel that acid has eroded with CPP-ACP, a substance acquired from milk, or strengthen teeth with topical fluoride applications. Instead of the dental drill, many dentists now turn to air abrasion for decay removal, equipment that emits a fine stream of abrasive particles that harms less healthy structure than a drill. And if lasers continue to develop at their current pace, we’ll be able to use this technology to perform much more precise decay treatment than possible with manual instruments. As a result, we’ll be able to treat decayed teeth with less invasive means to preserve as much healthy structure as possible. As these and other developments continue, MID promises a bright future for preventing and treating tooth decay. As a result, there’ll be less tooth structure loss and more attractive and healthy smiles. 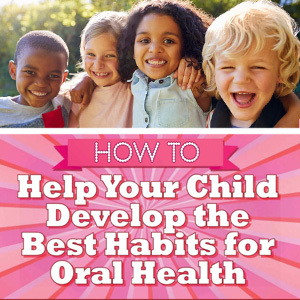 Helping your infant or toddler develop good dental habits is one of the best head starts you can give them toward optimum oral health. But even after they’ve matured enough to handle hygiene tasks without you, they still need your guidance. This is especially true in the “tween” and teen years. Although they’re beginning to flex their independence muscles, they’re still vulnerable at this age to peer pressure urging them to try things that, among other outcomes, could hurt their oral health. Here are 3 areas where your input and guidance could save your older children and teens from oral health problems. Sports activities. As children mature, they may also become involved with various physical activities, including contact sports. Years of diligent hygiene and dental care can be undone with one traumatic blow to the mouth. You can help avoid this by urging your child to wear a mouth guard during sports activity. While there are some good choices on the retail market, the most effective mouth guards are custom-created by a dentist to precisely fit your child’s mouth. Oral piercings. While expressions of solidarity among young people are popular and often harmless, some like oral piercings and their hardware could potentially damage teeth and gums. You should especially discourage your child from obtaining tongue bolts or other types of lip or mouth hardware, which can cause tooth wear or fracture. Instead, encourage them to take up safer forms of self-expression. Bad habits and addictions. A young person “spreading their wings” may be tempted to dabble in habit-forming or addictive activities. In addition to their effect on the rest of the body, tobacco, alcohol and drugs can have severe long-term consequences for oral health. Unsafe sexual practices could lead to the contraction of the human papilloma virus, which has been linked to oral cancer in young adults. Be sure your teen understands the dangers of these habits to both their oral and general health—and don’t hesitate to seek professional help when a habit becomes an addiction. Tooth decay is a highly destructive dental disease, responsible along with periodontal (gum) disease for most adult tooth loss. And we become even more susceptible to it as we get older. 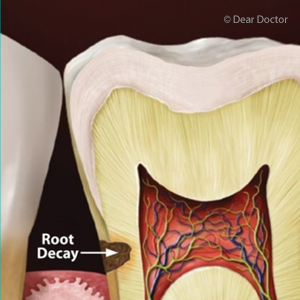 One form of decay that’s especially prominent among senior adults is a root cavity. Similar to a cavity in the crown (visible tooth), this form instead occurs at or below the gum line in the roots. They happen mainly because the roots have become exposed due to gum recession, a common consequence of periodontal (gum) disease and/or brushing too hard. Exposed roots are extremely vulnerable to disease because they don’t have the benefit of protective enamel like the tooth crown, covered instead with a thin and less protective mineral-like material called cementum. Normally, that’s not a problem because the gums that would normally cover them offer the bulk of the protection. But with the gums receded, the roots must depend on the less-effective cementum for protection against disease. Although we treat root cavities in a similar way to those in the crown by removing decayed structure and then filling them, there’s often an added difficulty in accessing them below the gum line. 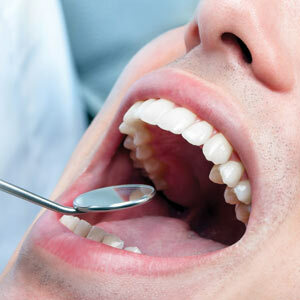 Because of its location we may need to surgically enter through the gums to reach the cavity. This can increase the effort and expense to treat them. It’s best then to prevent them if at all possible. This means practicing daily brushing and flossing to remove bacterial plaque, the thin, built-up biofilm on teeth most responsible for both tooth decay and gum disease. You should also visit your dentist at least twice a year for professional cleanings and advanced prevention methods like topical fluoride to strengthen any at-risk teeth. You should also seek immediate treatment at the first sign of gum disease to help prevent gum recession. Even if it has occurred, treating the overall disease could help renew gum attachment. We may also need to support tissue regeneration with grafting surgery. Root cavities are a serious matter that could lead to tooth loss. But by practicing prevention and getting prompt treatment for any dental disease, you can stop them from destroying your smile.